Set of 2 arm troughs provide a larger surface to lay foreams and wrist. Arm troughs provide a larger surface to lay foreams and wrist. The padded channel is 18" long. There is a drain hole at the elbow end. Curved sides help hold the arm in place. The pads attach to the arm tube. To install the arm trough you will need to enlarge the screw holes on the underside of the arm tubes. Note: the metal arms are stainless steel, your drill bit must be able to cut through S/S. You can ask for a quote for arm troughs installed before the chair is shipped. Please Note: If Arm Support Pads for Ocean Models are installed on unit, this may limit the Flip-up arms feature. 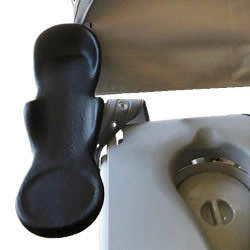 If the Flip-up arm feature is being used for user transfer, consider needing the Arm Extenders for Ocean VIP.